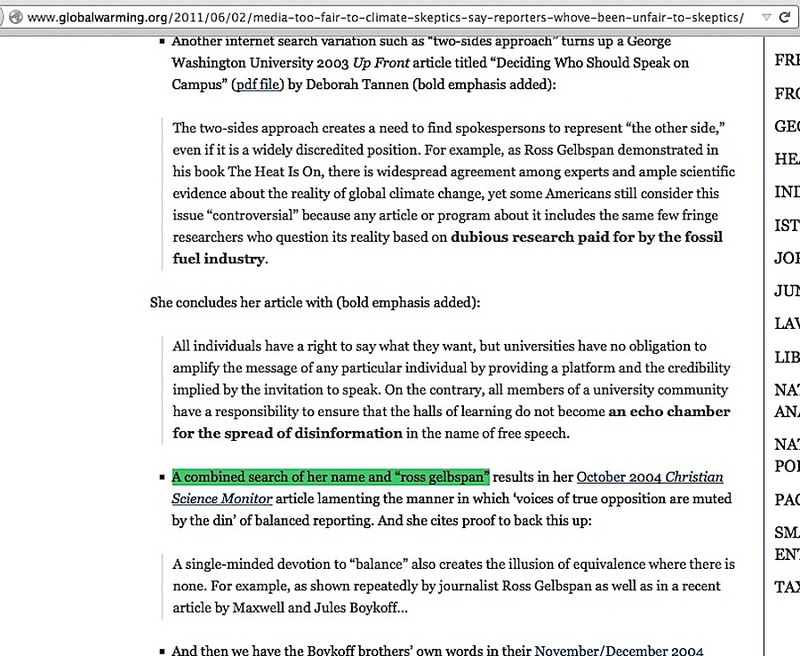 In my previous blog post, I showed a window into the world of far-left environmentalist reasoning, using the exact illustration of how Desmogblog co-founder James Hoggan immediately believed Ross Gelbspan’s “the science is settled / skeptic scientists are industry-corrupted shills” core talking point as literally true upon first reading it, never reading alternative science assessments or doing the most basic fact-checking to see if Gelbspan’s accusation was true. Now, let’s have a look at another window into the world of far-left environmentalist reasoning by seeing Hoggan’s analysis of anyone who disputes global warming as settled science. … the toxic nature of public discourse… there were very few people that I spoke to who were as eloquent as the American linguist Deborah Tannen … she believes that our habit of attacking the motives and character of those who disagree with us not only distracts the public from real issues, but it actually undermines the real opposition. “It obscures,” she says, “the passion and the outrage that are at the heart of authentic public debate.” The quote from her: “Accusing opponents of venal motivations makes it easy to dismiss valid criticism.” .… My point here about propaganda is that it’s far worse than misinformation, that’s just the superficial part of it. 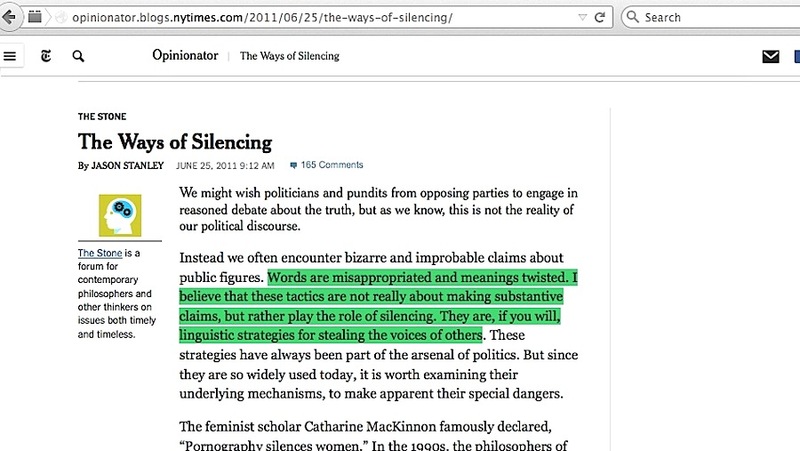 Hoggan is actually reading nearly verbatim quotes at the end there from philosophy professor Jason Stanley’s New York Times June 25, 2011, “The Ways of Silencing” (at a time when Stanley was at Rutgers University). The verbatim quote about Fox News’ audience appears in Stanley’s piece nine paragraphs later – an assertion that can either be accepted without question, as Hoggan did with it, or refuted. 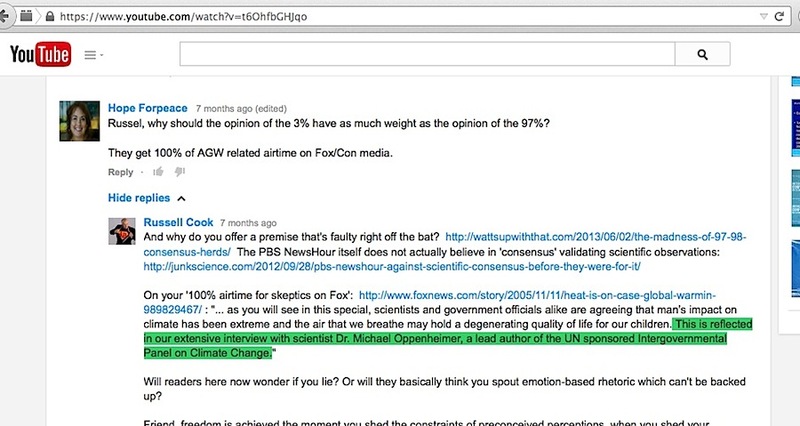 I encountered my own variation of that assertion when a critic at my ICCC9 video’s comment section (who repeatedly called me a liar in what some might call a harassment-style manner) told me essentially that Fox News and other conservative media offers no ‘fair and balanced opportunity’ for IPCC climate scientists. I pointed out how that is a demonstratively unsupportable position. Again, a window into the world of believing an assertion simply because it sounds like it might be true. The two-sides approach creates a need to find spokespersons to represent “the other side,” even if it is a widely discredited position. For example, as Ross Gelbspan demonstrated in his book The Heat Is On, there is widespread agreement among experts and ample scientific evidence about the reality of global climate change, yet some Americans still consider this issue “controversial” because any article or program about it includes the same few fringe researchers who question its reality based on dubious research paid for by the fossil fuel industry. …..
To justify preventing disinformation from being heard, you must first prove it is disinformation. When Tannen cites Gelbspan as proof of skeptic scientists’ disinformation and Gelbspan himself never proves those skeptics were paid and instructed to lie and fabricate false reports, Tannen becomes hopelessly stuck with the appearance of attacking the motives and character of critics who oppose something she belies is true, but cannot prove is true. By citing both Tannen and Gelbspan (as I detailed in my prior post here), Hoggan takes on the same damaging appearance. All paths lead to Gelbspan, and neither Hoggan nor Tannen are the least bit qualified to say skeptics’ research is “dubious” or “disinformation.” Yet Tannen, Hoggan, and Gelbspan use exactly the kind of disinformation they themselves imply is an unacceptable tactic, in order to support a side of the global warming issue that apparently cannot stand on its substantive claim but instead feels a compulsion to silence its critics by calling them ‘shills working for the fossil fuel industry.’ Accusing skeptic scientists of venal motivations sure makes it easy for all three – and arguably all others repeating those accusations – to dismiss skeptics’ valid criticism, doesn’t it? This entry was posted in James Hoggan, Narrative derailment by Russell Cook. Bookmark the permalink.